the pictures below schows the "Gnome DI Standard" as well as the "Gnome DI Plus" version. 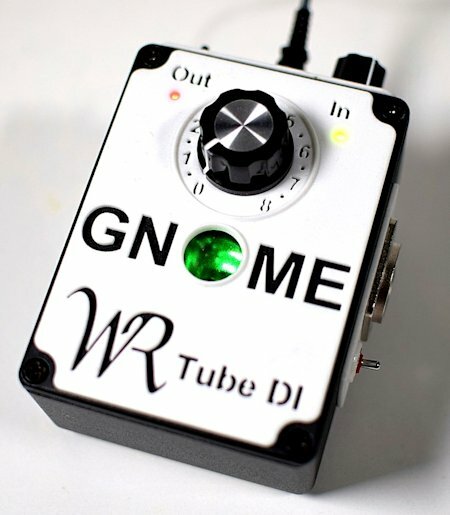 The WR Gnome Tube “DI” was created as a way of adding the warm harmonics associated with the use of tubes to your sound. Equally effective across the frequency range (20 Hz – 18 KHz), from low-level to loud, the quality of sound is consistently high, allowing the same amazing sound on stage as achieved in the studio. a) the GNOME LIGHT" = active version but without Led indicators. b) the"GNOME STANDARD" = active version with Led indicators. c) the"GNOME PLUS" active/passive version with Led indicators. - The "active versions", must be used with external power supply. I.e. without the power supply it will not operate at all. 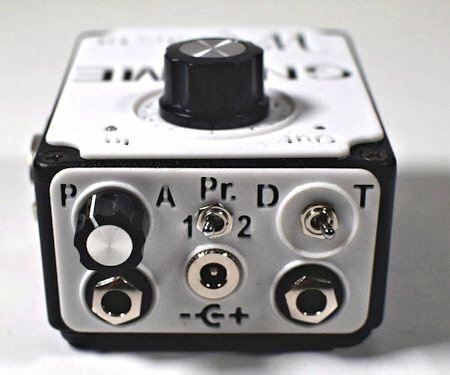 - The „active/passive version" can be used in two modes: with power supply and without power supply in this case it does operate as a passive DI box! This unique and innovative design is based on a specialised and limited availability ECC86 NOS tube, optimized to operate on 24 Volt DC, to create wonderful tone in a limited-edition, hand-built unit. 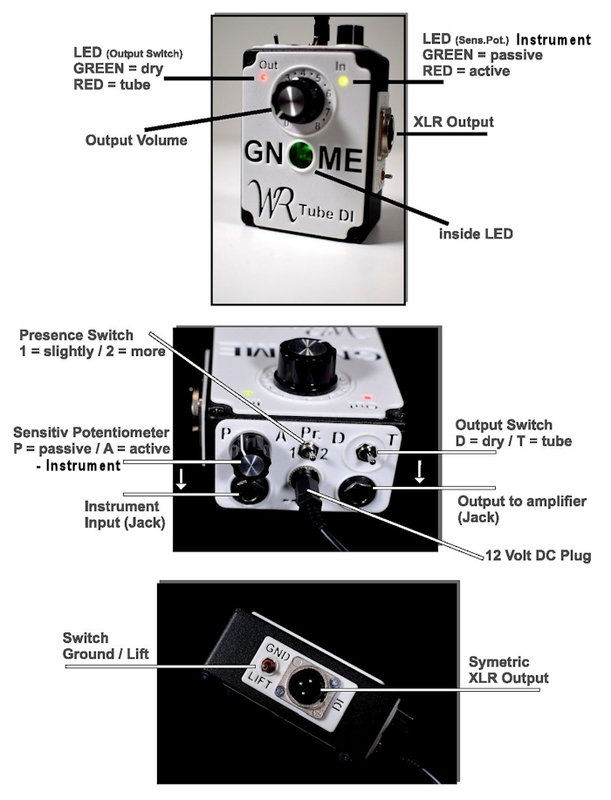 The “Gnome” is equipped with 2 Outputs (XLR and 6mm Jack). * The “DI” XLR Output is designed for mixing tables or computers and is equipped with a “Lehle” LTDI-L transformer as galvanic isolation. The “DI” Output also works even without connecting to the power supply (active/passive version), in this case as a passive “DI” Box. 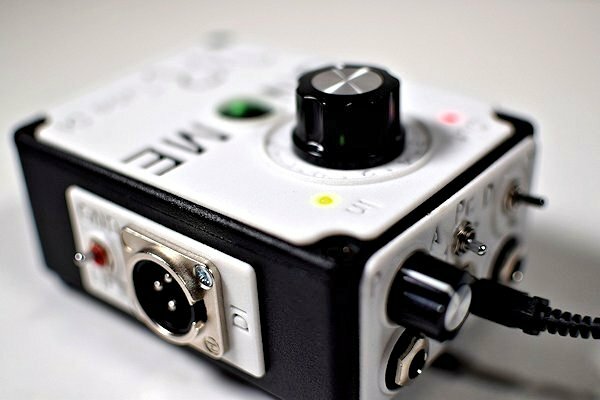 * The Jack Output directly connects your instrument to your Amplifier but with the option to use the tube sound. *	The Presence switch “Pr.”, has 3 positions: 1-0-2. This filter controls the higher frequencies (Presence): 0 = (Middle position) no increase; 1 = slight increase in Presence; 2 = larger increase in Presence. This filter gives the DI box an additional way to control the frequency response. *	The Output switch “D-T”. The Jack Output Switch has 2 positions: position “D” (Direct) or “T” (Tube) allowing the choice between Direct output or Tube output. *	The "GND/LIFT switch": Use this switch to eliminate “hum”. If the ground switch is set to "Lift", the built-in “Lehle” transformer ensures galvanic isolation between the shielding of the WR Tube DI and the earth conductor of the XLR cable attached. If this setting generates hum, activating the ground switch may solve this. When the ground button is set to "GND", the shielding of the DI and the earth conductor of the XLR cable are connected. *	The Sensitive Potentiometer is a sensitive potentiometer that allows continuous control of the input. This is especially useful if you own several basses with quite different output, e.g. “P” Passive and “A” Active. * The “Lehle LTDI-L" XLR transformer as galvanic isolation is one of the best transformer worlwide. Quality first! * they show the respective positions of the "Output" switch as well as those of the "Sensitive" potentiometer. *	Robust Die cast Aluminium Enclosure. *	A “Sensitive Potentiometer” input-gain potentiometer “P” Passive and “A” Active (for a better adjusting of passive and active instruments). *	A “D-T switch” route the sound between Direct output or Tube output. *	A “DI-XLR” symmetric Output signal plug with Ground switch. *	A “Lehle LTDI-L Transformer”. *	Power supply 100-240 Volt AC to 12 Volt DC 1 Amp. test reviews in german language! Video presentation done by "Ralf Gauck"
from the electro-acoustic to electric guitars and even several keyboards." Kann man die Geräte auch antesten? welches sich durch das größte deutschsprachige Bassforum Bassic (www.bassic.de) gebildet hat angetestet werden. Wie genau? Das erfahrt ihr von Christian Eller ( info@christianeller.de ).